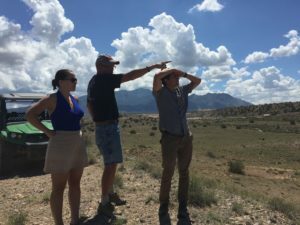 When winemaker Gilbert Gruet came from Champagne to New Mexico in the 1980s for a family vacation, he likely sought the scenic beauty that earned the state’s nickname “Land of Enchantment”. What they found, however, was great terroir and a burgeoning wine industry. The family planted roots, and their 30 year catapult to becoming one of America’s greatest producers of Methode Champenoise has transformed this land into a “Land of Sparkling”. Gruet Winery’s Brut has been a staple at Vintology Wine & Spirits and my family events for years. The ‘coming to America’ story has been the special touch when I’ve toasted with Gruet at many Thanksgivings. On my recent tour of America’s southwest wine regions, Gruet was my number one priority. I pulled off Pan American Freeway in Albuquerque and arrived at a large facility, the winery that produces all of Gruet’s many sparklings and still wine cuvees. Laurent Gruet, Head Winemaker and founder Gilbert’s son, greeted me. 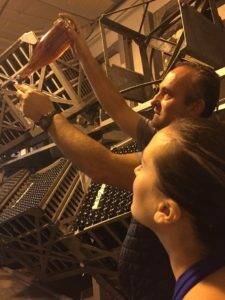 He was joined by Operations Manager Michael Dominguez, and together they would lead me on tour that would cover Gruet’s history and future, sparkling wine production and the evolution of New Mexico wine. Nobody embodies ‘Champagne comes to New Mexico’ more than Laurent Gruet. Born in France, his childhood was spent alongside his father at Gruet et Fils winery in Champagne. His father, Gilbert, was a major force in Champagne and in 1967 created the Union Vinicole des Coteaux de Bethon. The Land of Enchantment attracted the Gruets for a 1983 family vacation. On a fluke, father Gilbert met several European winemakers who had successfully planted vineyards south of Albuquerque. These winemakers, however, were not the first to notice the favorable climate and soil conditions of the state. New Mexico’s long history of wine production starts believe it or not in 1629! After the first grape plantings in southern New Mexico, viticulture took hold and within one century over 1,000,000 gallons of wine were in production. The wine industry suffered a double whammy that devastated progress, first with the flooding of the Rio Grande in the 19th century, and then the noble experiment… Prohibition. It wasn’t until the 1970s and 80s that investors, namely Europeans like Gruet, saw inexpensive land, a favorable climate and soil, and a promising market. The modern New Mexico wine industry was born anew, and today there are over 60 wineries that are nearing that 1,000,000 gallon mark again. 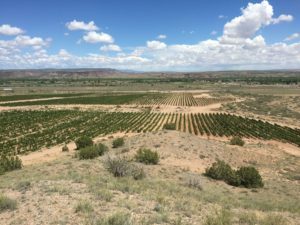 Gilbert Gruet is in part responsible for New Mexico’s current industry with his decision to take a leap of faith and plant an experimental vineyard in 1984. 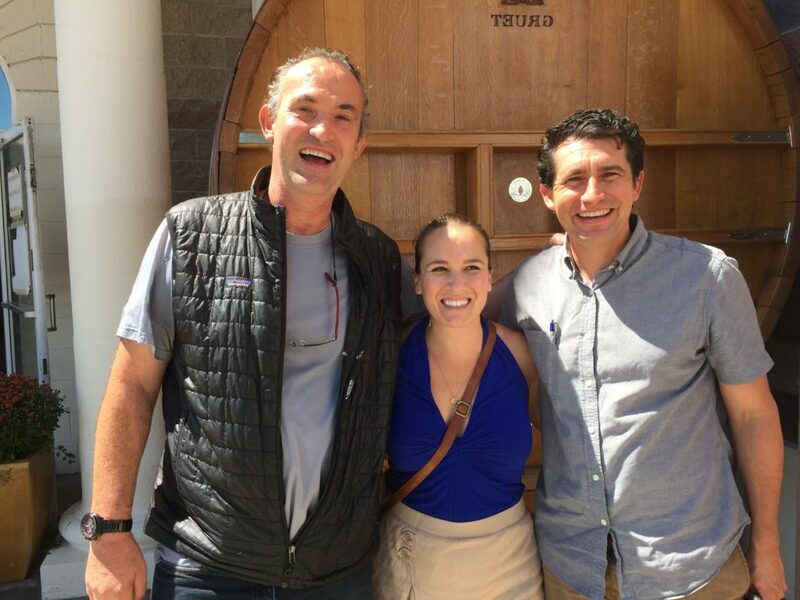 Two of Gilbert’s children, Nathalie and Laurent, would join their father in this American winemaking endeavor. Laurent, who had studied at Lycee Viticole de la Champagne and made his first champagne in 1981 back in France, would eventually take the lead. 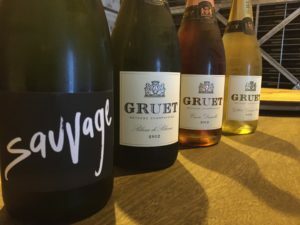 In three decades, Gruet Winery has achieved critical acclaim. In 2011 Wine Spectator named the Gruet Blanc de Noirs a Top 100 Wine of the World, unheard of for a sparkling wine under $20. 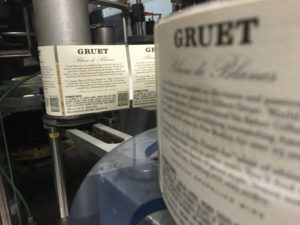 Gruet is a favorite of retailers, sommeliers and is sold in almost all states and several countries. Gruet is synonymous with Methode Champenoise, and Laurent walked me through the production process. This was an absolute high for me. It’s extremely rare to witness the sparklng wine process in person. I’ve visited countless sill wine wineries, but even those who make one or two sparklings often send out of house for production. It’s been me and YouTube until now… until Laurent Gruet let me peek behind the curtain! Méthode champenoise, also named the traditional method, is the most tedious, expensive, time consuming and labor and equipment intensive path towards sparkling wine. After an initial fermentation, a second fermentation occurs with the addition of yeast within the very bottle the customer will pop. This results in natural sparkling wine, but it’s not near over… the dead yeast (lees) must be removed from the bottle. Who wants to drink that! Historically getting the lees out of the bottle started with a riddling rack, ‘invented’ by the famous Widow Clicquot, in which the bottles are turned downwards and lightly turned to move the lees to the neck. Today, a gyropalette performs the same task automatically and much more quickly on many bottles at the same time. A gyropalette looks like a big cage cube, and motors and automatic controls emulate the slow turning of the bottles. 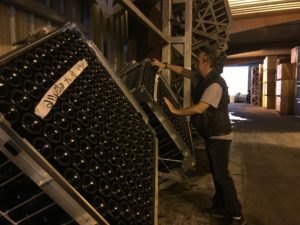 Gruet Winery has a wall of gyropalettes, and Laurent flipped the switch to activate one round of remuage. Want to see a grown wine professional clap her hands like a child with a jack in the box? Laurent moved me down the disgorgement line, in which the inverted bottle necks are cooled. This freezes the lees in the neck into a little icy cap, and an automated line pops them out, finally fitting the bottles with a Champagne cork. YouTube had come to life, and I’ll never doubt the price of a bottle of Methode Champenoise again! With a huge tasting room renovation underway, Laurent and Michael sat surrounded by cases and cases to taste the Gruet line-up. I just love their Brut that we sell at Vintology, so the Sauvage NV was a natural shoe-in. Both are dry, but the Sauvage is a bone-dry sparkler, and with 100% Chardonnay is delicate and pale in color. Another stand-out was the Gruet Grande Reserve, a Blanc de Blanc and Laurent’s personal favorite to make. His first cuvee as a newbie winemaker was a Blanc de Blanc and 1981, and this cuvee demonstrates full circle of a long wine career. I asked Laurent, what do your Champagne peers think of all this? He often travels back to visit the Gruets who remain in France. These trips often include sharing wines and blind tasting the New Mexico sparklers against the Champagnes. Laurent shared that his peers think highly of this American endeavor… and Gruet tasted blind always triumphs! New Mexico’s vineyard areas are as varied as its beautiful geography. The original 1983 Gruet Vineyard at 170 miles south of Albuquerque was a bit to far for my visit. Instead, after saying my goodbyes to Laurent, we headed just a few miles away to the newest venture of Gruet. The Santa Ana Vineyard is unique in many ways. These 30 acres located just off I-25 represent the only partnership between a winery and a Native American tribe that I’m aware of. The project began a few years ago, when the tribal council allowed Gruet to grow grapes on a small piece of their 80,000 acres. 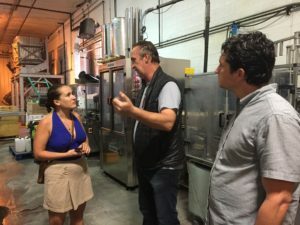 Past wine visits with ATV tours have spoiled me… and Gruet didn’t leave me disappointed. We arrived to the vineyard and hopped into an ATV… driven by Bill Jackel. Bill Jackel is the very colorful vineyard manager of the Santa Ana Vineyard. 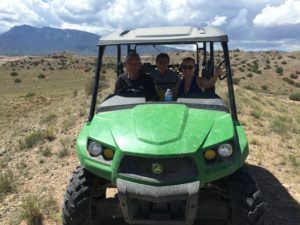 He gave us the bouncy ride to a crest overlooking the 30 acres, while sharing his extensive career in greenhouse management and his involvement with Gruet. Bill was responsible for ‘from scratch’ construction of the Santa Ana Vineyard, and continues the day to day management and harvest. Bill has come a long way from a greenhouse in the damp northern US climate… Albuquerque has a cold semi-arid climate. Brilliant sunshine defines the region, averaging 278 days a year, with very little precipitation. Bill explained that irrigation is only possible through the tribal land’s water rights and the close proximity to the highway. He pointed out another plot of land far in the distance that would have been ideal for viticulture, but the expense and difficulty of bringing water and utilities to the area makes the plot impossible. Standing on that crest, one would never expect a Grande Reserve Blanc de Blanc could be born of that desert. And yet, it will be. The first harvest of the Santa Ana Vineyard just occurred, and the future possibilities of this New Mexico land, and more, is unlimited. It’s truly a Land of Sparkling. Oh shucks, I missed it! Days after I departed, Gruet held the grand opening of its new Santa Fe tasting room at the Hotel St. Francis. I did peak in the window, seeing an almost complete stylish lounge/bar area, with a few Gruet cases waiting for tourists. You can also visit the winery and a newly renovated tasting room in Albuquerque. For the seasoned wine traveler, Gruet Winery is a desired jolt. Gilbert and Laurent’s expat story, the complexity of sparkling wine, the novelty of New Mexico… I suppose it’s very enchanting too! A big thank you to Laurent Gruet, Michael Dominguez and Bill Jackal for a wonderful visit!